Your business hours may finish, but your customers need you at their side all the time. So, you have no choice but to entertain their demands. Following, we are going to show you how you can improve your after-hour customer support. It will be a major win for your business. This becomes even more critical if you’re working from the location other than the client location. For example, if your client is from the UK and you’re providing support from the USA. In that case, the majority of your working hours will be a non-working hour for your client and vice-versa. 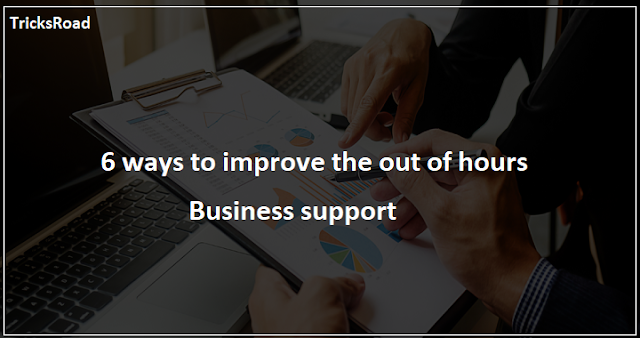 In that case, to ensure the proper working and tackling the issues of your client, you have to improve out of hours business support. This will ensure no matter what time zone you both work, there will be always proper support of client business. Considering all these, let’s talk about how to improve out of hours of business support for organizations. This will ensure the full satisfaction of your customers. Knowing someone is available can apse your customer and let them hold over for the next day. You should know it only takes a minute to question whenever the perceived emergency is one, or you better wait and deal with the issue in your normal business hours. That aside, if you show you are available every time, you show you care about your customers. This creates a positive image of your business and grows customer loyalty. Much of the work done today is completed remotely. In case you make some changes and have someone available through mobile app one evening a week, the customers will get help after hours. It’s important you tell your customers in advanced that this support is limited. This is just like the emergency option. The goal here is to make your customers realize that someone is available at least. You should know every out of hours call center is laced with such messages. A response from customer support telling the customer to go to a knowledge base is exhausting. But an after hour canned response which has useful links to asked questions is accepted. If the links don’t answer the question, then you should offer your customers the next level of support. It will help you retain them no matter the issue. If you don’t have prerecorded tutorials, you are not offering value to your customers. The fact is, some questions are asked over again and again. Pre-recorded tutorials are one way to support customers after business hours. So, you need to invest some money and creative effect and relevant how-to videos to walk people via troubleshooting. In the canned support message, you should offer detailed tutorials and walk people via the exact steps to solve an issue. You will need to create a customer forum where the existing user helps another pole with their questions. You will need to offer incentives incurring point system for a discount off a product. You can also send logo items once the customers reach a certain level. Most users do like to help other people and are online after business hours. You can make them an unofficial part of your support team. You have to treat these people well as they play an important role in helping you with your out of our support need. These people help improve your customer experience. Chat is intended to be a live experience. This is where the client gets an immediate response from customer support. It can still be used as a tool for after hours. There are many options that let you deal with offline messages. These were all about how to improve out of hours of business support and ensure complete client satisfaction. This way, you can work without any issue of different time zone and also ensuring no stone is left while serving the client. If you also support some client who is not in your time zone, please share your experience with us. For more similar business-related content, please check our business section.